Numerous studies have been conducted where subjects watched humorous shows for a half hour or more and in study after study, researchers found, over periods of days or weeks (depending on the study) that the subjects experienced lower blood pressure, decreased cortisol, decreased blood sugar (in persons with diabetes), proteins angiotensin, and renin (high levels can lead to kidney disease), decreased muscle tension, and diminished pain. 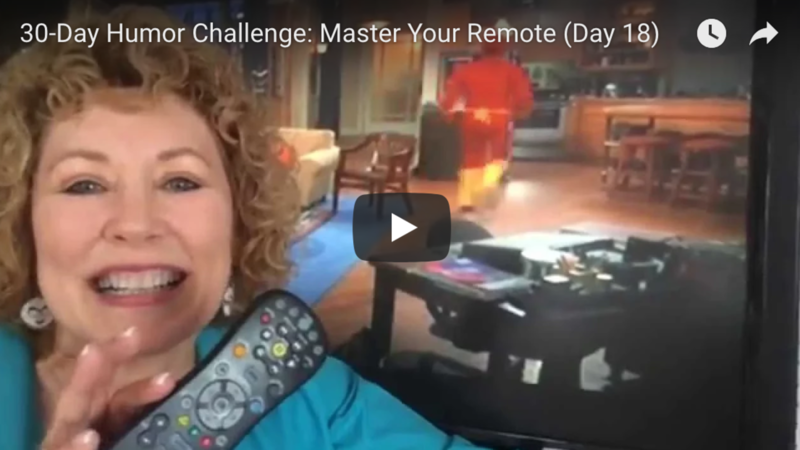 So today’s humor challenge: become the master of your remote control! Watch 30 minutes of something funny on TV. It’s enjoyable to watch funny shows when you happen to catch them by chance, but what we’re trying to create in this humor challenge is a habit. I want you to become strategic in the way you get your laughs. Humor by chance is entertaining and does have value. But humor by choice ramps up your benefits to a higher level. I love Big Bang Theory and have watched the episodes so many times I know most of them by heart. I own the DVDs, but I also TiVo episodes for easy access. I keep a variety of sitcoms on hand to suite my mood: Community, Modern Family, and classics like Cheers, MASH, and Seinfeld. I keep many of my favorite movies on hand, like Steel Magnolias, When Harry Met Sally, Meet the Fokkers, and my favorite of all time, In & Out, with Kevin Kline. Again, your humor challenge for today is to watch something funny on your television for 30 minutes. Become master of your remote! Ideally you want to be scheduling 30 minutes of some kind of humor daily to get the most bang for your yuk. Being intentional about watching funny shows and movies can be part of your repertoire. Congratulations on committing to exercising your sense of humor. I hope you’ll join me tomorrow for the next challenge. I’m Karyn Buxman reminding you to create a humor habit and reap the benefits. Humor is power!